at ExhibitDEAL offers many different options to transport and protect your trade show investment - anything from plastic molded shipping cases, banner tubes, graphics cases, vinyl carry bags to wooden crates. 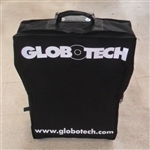 Choose optional foam-lined cases for maximum protection or wheels for added mobility. If you need a custom sized trade show case we can assist with that too!